The Role of the Autonomic Nervous System in Atrial Fibrillation. Why does a bloated stomach cause AF? 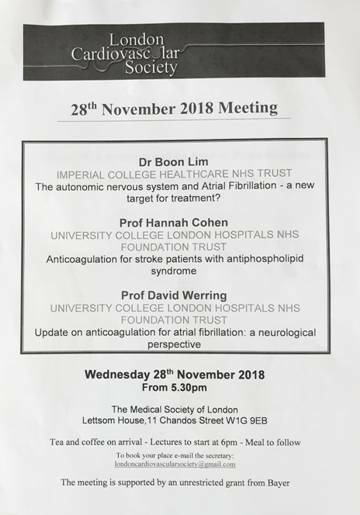 Dr Lim was invited to speak on the 28th Nov 2018 at the London Cardiovascular Society Meeting held at the Medical Society of London, on Chandos Street, in Central London. In his lecture, Dr Lim discussed some of the principles around the role of the autonomic nervous system in atrial fibrillation – discussing in particular his research leading to a PhD at Imperial College London where he performed studies in which performing high frequency stimulation of the cardiac nervous system (the autonomic nervous system of the heart) through electrodes places within the human atrium. The figure below illustrates how there is a complex and intricate network of nerves that supply the heart (and gut) which arise from the brain and eventually reach the heart. 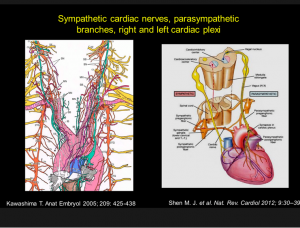 These nerves carry both sensory (is sensing) and motor (i.e. action or doing) traffic. For example a strong surge in a particular nervous system (the sympathetic nervous system governing the flight or fright response) may lead to an increased heart rate and strength of contraction. 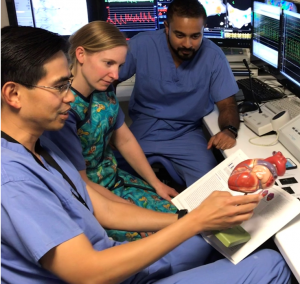 Conversely, stimulation of the vagus nerve (which governs resting and digesting), may lead to a significant slowing in heart rate, and can sometimes trigger atrial fibrillation. 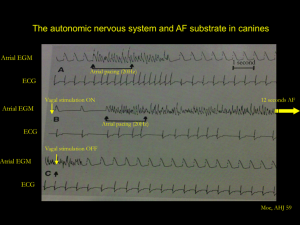 The role of the autonomic nervous system in AF was elegantly demonstrated by Gordon Moe, in the 1950s who demonstrated that for AF to persist in dogs, the autonomic nervous system (vagal nerve) needed to be continuously stimulated, as show in the figure below. Moe published this work in the American Heart Journal in 1959, and this seminal piece of work is still relevant today as it was almost 60 years ago! If AF is triggered clearly by autonomic influences, there may be appropriate drugs, or catheter ablation strategies to help improve symptoms.